Today, August 15, Germany’s second largest airline next to Lufthansa has applied for insolvency. The step came after its major shareholder Etihad Airways (29.2 percent) refused to pump more funds into the ailing carrier, despite a former promise for financial support until the autumn of 2018. With Etihad’s decision to withdraw their support “the forecast for our future is negative,” stated the carrier. The imminent bankruptcy is a prerequisite to apply for insolvency by any indebted enterprise. This accounts for AB because the airline has constantly lost money since 2008, except for the year 2012, despite Etihad’s continuous yearly payments to cover the accrued losses. Etihad bought into AB in 2011 as part of their former strategy to acquire smaller airlines like Air Serbia, Air Seychelles, Jet Airways or Darwin Airlines to feed passengers and cargo shipments into their hub in Abu Dhabi. A financially devastating exercise proven by most of their ailing satellite carriers, particularly by Air Berlin. Last year, AB posted a record loss of more than €780 million. Together with the carried over losses of the past years, a Himalayan high debt mountain of estimated €1.2 billion has put the airline under huge financial strain. Obviously too much for shareholder Etihad who is struggling with severe financial problems itself as result of a failed partnership strategy initiated by their former and meanwhile fired CEO James Hogan. Flights are not affected by Air Berlin’s bankruptcy petition, stated the company, thus soothing worried passengers and cargo clients alike. 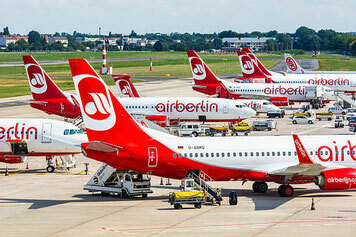 All operations, including intercontinental services, will be continued without interruption, financially secured by a transitional loan granted by the German Federal Government, assured Air Berlin. What will come out of this? The most likely solution will be that AB rival Lufthansa takes over major parts of the London registered carrier (Air Berlin PLC & Co., British Trade Register: 5643814). In a release, LH assured to support the restructuring of Air Berlin in accord with the German government, confirming ongoing talks to take over parts of the AB Group. The insolvency enables AB to get rid of their debts, which was a precondition for Lufthansa to acquire its national rival. In a statement, the German Aviation Association (BDL) welcomed the indicated political support for the restructuring of AB. AB’s freight subsidiary Leisure Cargo does not seem to be influenced by its parent company’s bankruptcy since being a Limited Liability Company it acts as an independent legal entity.